Experience virtual reality without paying the hefty price associated with buying top of the line computer! With the Niantic Tech NTVR-G04E Virtual Reality Headset, you can do just that! Niantic Tech's Virtual Reality Headset uses your iPhone or Andriod mobile device to create a fully immersive Virtual Reality environment! Our VR headset is awesome with full audio immersion, with a complete audio experience like no other! Connecting to the headphone port on your mobile device the headset adds stereo sound to your experience. Bluetooth is great, but the delay is not necessary, with our direct to audio technology you plug in your mobile device directly to our headset and get Full Audio Immersion! Do you wear glasses? No problem with our virtual reality headset, it is comfortable to wear with or without glasses. Mobile device compatibility concerns are a thing of the past with up to 6.5" screen compatibility. The Niantic Tech virtual reality headset works with the iPhone x or iPhone 8 plus and smaller Apple devices. Android users aren't left behind; our virtual reality headset is compatible with the Samsung Note 8 and all other Android phones w/ 6.5" screens or less! Wearing our virtual reality headset is comfortable, with our lightweight and highly supportive securement system, daily use of our virtual reality headset is comfortable for extended sessions. 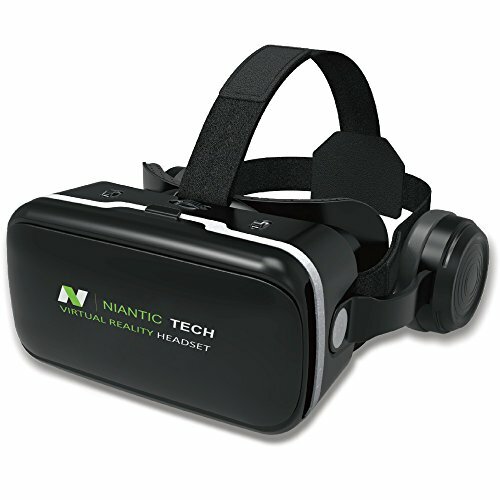 The Niantic Tech virtual reality headset is made of high-quality material and will last a very long time. We take pride in manufacturing a quality product using high-quality materials! Adjustable from the optics to the securement system, using high-quality material all around ensures you are comfortable and can enjoy immersive virtual reality. If you have any questions about this product by Niantic Tech, contact us by completing and submitting the form below. If you are looking for a specif part number, please include it with your message.